Erickson. They have two children; James and Tracy. Marie, after graduating from Erickson Collegiate, went to Winnipeg to take a secretarial course. She worked at the Administration Office at Riding Mountain National Park for some time. In June, 1975, she married Larry Zatylny and they farm at Sandy Lake. Besides being a busy farm wife and mother of their two children; Marsha and Scott, she works at Reg's office. Erik Nystrom was born in Kramfors, Sweden in 1853. His schooling and carpenter training was completed in Sweden. Erik was married in 1876 to Sophia Strand. They had four children born in Sweden, Victor, Tekla, Amelia and Albert. 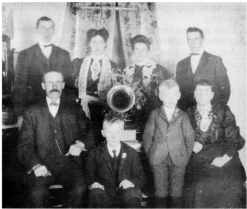 In about 1889, Erik and his oldest son Victor emigrated to Canada. They came to Minnedosa and Erik found work as a carpenter and Victor worked in a store owned by an uncle, Mekal Nystrom who had come to Min­ nedosa at an earlier date. At this time the Municipality of Clan william had been surveyed and land was available for homesteads. Erik applied for a grant to buy the S.E. 20-17-17W. A log house built from hand hewn timber, cut on the farm was erected and a few years later his wife Sophia and three children emigrated to Canada to live and work on the homestead. Two more sons were born, Ed. in about 1897 and Robert in 1900. The land was cleared by hand a few acres every year, other improvements were made and in April, 1899, Erik received title to his homestead. In the new settlement of Scandinavia, many settlers had come from Sweden. Their spiritual upbringing was through Lutheran Con­ firmation. A Lutheran congregation was organized in 1891. A parsonage was built in 1897. Erik helped to build both the church and parsonage. In 1926, Erik and Sophia Nystrom celebrated their Golden Wedding Anniversary in the church he had helped to build. Erik died in 1928, Sophia in 1935. Harvesting of grain and timber was the only way the pioneers could earn a living. Oats were grown to feed the horses and in later years some wheat and barley was grown to sell. Harvesting of spruce trees for logs was an all winter job. The Nystrom farm had a steam engine and a sawmill. Sawing logs into lumber was done in the spring. Farmers in the neighbourhood would also bring logs to be sawed into lumber. Many stables and sheds in the district had "slab roofs" which would last 30 years or more. The steam engine was also used to power a threshing machine. It was in use until the mid 1930's. The family continued to live in the district for many years. Victor moved to Erickson, an early settler in the Village. Eric Nystrom Family - 1908. Back Row, Left to Right: Victor, Tekla, Amelia, Albert. Seated: Erik, Ed, Robert and Sophia. Mounted Police as mail carrier in the Yukon. He returned about 1910 and settled on the Erik Bolin homestead S.W. 20-17-17W. Ed farmed on the S.W. 29-17-17W, also did carpenter work. He moved to Vernon, B.C. in the mid 1940's. Robert farmed the homeplace and did carpenter work until 1936 when he moved to Glenboro, Manitoba. Victor Erick was born in Kramfors, Sweden, in 1880. The son of Erick and Sofia Nystrom, he came to Canada at nine years of age. They moved on to a farm in the Hilltop district S.E. 20-17-18W. On April 26, 1922, Victor married Ellen Marie Jensen. They had three children, Stanley, Lettie and Ada. Victor became a carpenter by trade, helped build the Scandinavian Lutheran Church and parsonage along with many houses, barns, buildings at Dauphin Airport and assisted with the Lutheran Chapel in Erickson in 44- 45 now owned by Grandson, Lance Shell born. During the years, he owned a lumberyard, was manager of Imperial Oil station. Victor and Ellen lived on the farm for a few years, pt. S.E. 32-17-18W, presently owned by Bill and Edith Earley. before retiring to Erickson with their daughter Ada and son-in-law Glen. Victor and Ellen were members of the Scandinavia Lutheran Church. Victor sang in the choir and was a school trustee. Ellen was a seamstress, sewed all her own clothing as well as their children and grandchildren's clothes. Ellen helped Dr. Rutledge deliver a few babies, also her first grandchild, Judith.